There are four common species of sea turtle in our waters: Kemp’s ridley, loggerhead, Atlantic green, and leatherback. When water temperatures dip below 50 degrees, around late October, sea turtles that do not migrate south for the winter months may become a victim of cold stunning. According the National Oceanic and Atmospheric (NOAA) Fisheries, the term cold stunning refers to the hypothermic reaction that occurs when sea turtles are exposed to prolonged cold water temperatures. Initial symptoms include a decreased heart rate, decreased circulation, and lethargy, followed by shock, pneumonia and possibly death. Atlantic Marine Conservation Society monitors beaches with volunteers to look for these turtles to get them the help they need. 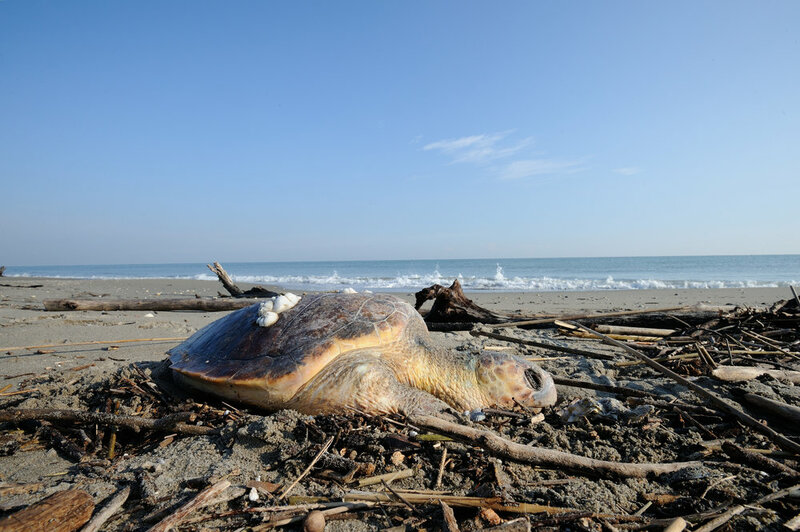 Even if a sea turtle appears to be deceased, there is a chance it is in fact alive and can be saved. Whether you join us for beach monitoring workshop or simply walk the beach on your own, you can help save sea turtles in New York. Most important, keep the NYS Stranding Hotline number: 631.369.9829 in your phone and call immediately if you find a sea turtle whether you think it is alive or deceased. Tips for Beach Monitoring – Do a Beach Cleanup! Bring marine debris data sheets. The ShowLatLong app can be used to record the GPS locations of turtles and marine debris, and the Tides Near Me app will help you determine the tides. Share your data with AMCS! Beach location, time of walk, distance covered, weight of marine debris found (and forward data sheets), distance covered. Enter a beach cleanup online here. If an animal is encountered, suspend beach cleanup! Questions or want to join us as a volunteer? Email volunteers@amseas.org. Conservation starts with you!